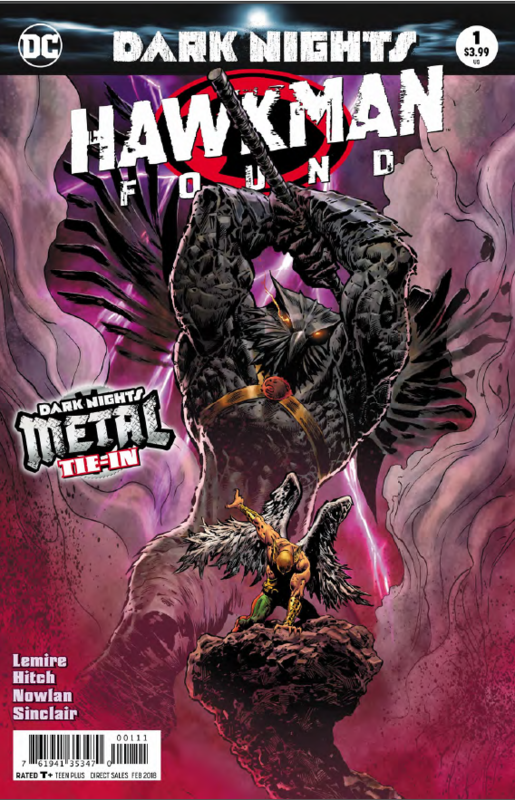 Hawkman: Found #1 Review – AiPT! Take a journey into the one of the darkest corners of the DC Universe as a mysterious man tries to piece together what happened to Hawkman, and how it all connects to the events of DARK NIGHTS: METAL! When we last left Dark Nights: Metal #4, we were confronted by the horrific sight of the true Master of the World Forge: Carter Hall. Transformed into a monstrous giant mockery of his persona Hawkman, Carter has seemingly succumbed to the Dark Multiverse, much like his recently-exploded soulmate, Kendra Saunders. While questions remain and, honestly, very little is answered, this one-shot gives a glimpse into the living nightmare facing Hall and his seemingly found destiny. Carter Hall’s final journal has been central to discovering the mystery of the Dark Multiverse, though he himself did not know exactly what he had been finding across the world. Batman followed the journal throughout the days leading up to his being sucked out of this world by Barbatos’ minions, although it really did him little good. In his dream state, Carter sees himself as Hawkman, soaring in the air until he falls uncontrollably, waking just before he hits the ground. His days in the nightmare outside his dreaming are fraught with Mn-Hawk attacks and his past lives, countless numbers of him stretching back past Ancient Egypt to the beginning of man. I don’t want to go too far into the plot, since it really serves just to highlight where Hall has been this whole time and what is happening to him, mentally, while Batman and Superman find his hideous form guarding the Forge. The important imagery comes after Carter has a fight with some hulking, evil version of himself, where he finally straps on mechanical wings and flies to freedom. Much like Icarus, Carter flies too close to the sun, causing his wings to melt and collapse, plunging him back towards the ground where the cycle begins again. Writer Jeff Lemire does an excellent job working in some key elements of dreams and nightmares that purport to represent some inner turmoil. The fight with oneself, for example, represents an internal conflict. Falling while frightened symbolizes a lack of control over a major struggle. Flying in a dream can represent, as Carter feels, freedom or control. Realizing that the entire comic is Carter’s recurring, waking nightmare is a terrifying sign of what might be left of the once great superhero. Is he in control of his new, monstrous form? Or is he a prisoner, trapped inside his own body, forced to live this nightmare for all eternity? I suppose we’ll have to wait for Dark Nights: Metal to conclude to find out.